City Hall says planned slow-growth ballot initiative would shift project’s costs to local residents. REDONDO BEACH — A voter initiative proposed for Redondo Beach’s March 2017 ballot could result in a smaller scale redevelopment of the city’s harbor district, potentially costing local taxpayers nearly $200 million, a city report estimated. A private developer is currently backing the harbor renovation project known as The Waterfront, but it could walk away if voters approve the King Harbor Coastal Access, Revitalization and Enhancement (CARE) Act. The Waterfront redevelopment project currently has a price tag between $300 million and $400 million, but CenterCal, a real estate development firm based in El Segundo, would finance the plan’s execution. CenterCal CEO Fred Bruning told The Log in July his company would not be able to move forward with its Waterfront project it had to abide by the conditions of the ballot initiative. “If it should come to reality I think it would effectively shut down any redevelopment on the Waterfront for decades, leaving the city with daunting financial obligations with no means to pay for them,” Bruning told The Log in an email a few months ago. Updating waterfront infrastructure, replacing area buildings and constructing a new boat launch ramp facility would cost Redondo Beach $196 million if required to adhere to the terms of the King Harbor CARE Act, according to a City Hall report made public Nov. 29. Taxpayers could be on the hook for the $196 million bill, as City Hall believes the ballot initiative would deter private developers from partnering with Redondo Beach to jointly revitalize the harbor area. One major source of contention is where a new boat launch ramp facility should be built. Plans currently call for the boat launch ramp facility to be built at Mole B, which is relatively close to King Harbor’s main entrance. In late November, the Redondo Beach City Council denied an appeal to have the new boat launch ramp facility moved to another location. The initiative, if passed, would require Redondo Beach to build a two-lane public boat launch with at least 60 parking spaces no more than 500 feet away. The ramp would also have to be away from the outer breakwall and not result in a net loss of boat slips. Rescue Our Waterfront (ROW), a local grass roots organization opposed to the Waterfront project as currently proposed, has long been campaigning to have the boat launch ramp facility built at Mole D. ROW supporters also filed the King Harbor CARE Act. Building a public boat launch ramp facility at Mole D would cost $4 million more than a similar venue at Mole B, according to the city’s Nov. 29 report. “The city’s marine engineer does not believe there is any location in King Harbor that meets all of the boat launch facility requirements required by the initiative,” city staff stated in its report. “While construction of a facility on Mole D … would most closely comply with the initiative, it would not fully meet the storm surge retrieval obligation, even with a new breakwall. “The cost to construct the facility is estimated to be $10 million and does not include a boat hoist or any loading/queuing docks,” the city staff report continued. 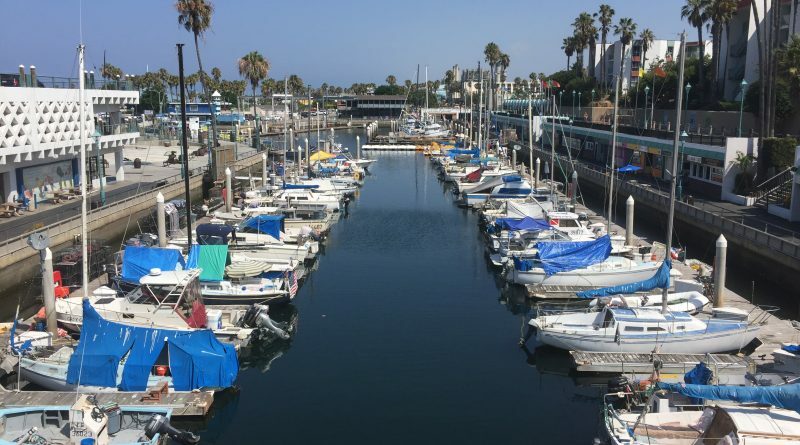 A boat launch ramp at Mole D as outlined in the ballot initiative would be inconsistent with Redondo Beach’s General Plan Policy and prevent the city from building a “unified seaside village,” according to the Nov. 29 City Hall report. “Development of a boat launch at Mole D would also separate the pedestrian related components of the project to two disconnected areas, thereby limiting the city’s ability to create a pedestrian oriented development,” city staff stated in its Nov. 29 report. In October, the city’s Harbor Commission green-lit a boat launch ramp facility to be built at Mole B. The Redondo Beach City Council, at their Nov. 29 meeting, rejected an appeal of the Harbor Commission’s recommendation. Redondo Beach resident Jim Light, who appealed the Harbor Commission’s recommendation to move forward with a boat launch ramp facility at Mole B, argued the city’s plan would result in increased traffic and a reduced number of boat slips. His appeal included letters from a boater, former Harbor Patrol captain and rescue boat captain. Each letter stated the Mole B was not the safest location for a public boat launch ramp facility. Building new parking structures in certain areas along the waterfront could be prohibited if voters approve the ballot initiative. Such a prohibition would have a ripple effect on boat launch ramp construction and, ultimately, the city’s ability to attract a development partner to help defray some of the project’s costs. City Hall has been contemplating a public boat launch ramp facility ever since King Harbor was first conceived. Building a boat launch ramp at Mole B would cost about $6 million, according to city staff – the lowest cost option available. City officials also argued a boat launch ramp could be built at Mole B faster than at any other location. Maintaining and operating a boat launch ramp facility at Mole B would cost $82,000 annually. City Hall estimates revenues from boat launch ramp would also be $82,000 annually, based upon 15 daily launches at $15 each. Nils Nehrenheim, one of ROW’s founding members, questioned the veracity of the city’s report and decision to allow a boat launch ramp to be built at Mole B. He said the city’s Nov. 29 report was biased and excluded a lot of items. “They say it’s going to cost Redondo Beach $200 million but we don’t talk about public-private partnerships or grants. They can get that money from anywhere they want,” Nehrenheim said. ROW submitted a 16-page rebuttal to City Hall about one week after the Nov. 29 report was made public. “A public-private partnership is still quite likely under the CARE Act. Many developers would seize upon the opportunity to rebuild commercial space in an attractive waterfront area, especially if the city pays the infrastructure cost and relieves the developer of that burden,” the ROW rebuttal stated. The ROW rebuttal also challenged the city’s assertion an additional breakwater would have to be built by Mole D to accommodate a boat launch ramp there. The King Harbor CARE Act proposes to amend Redondo Beach’s Measure G, which was approved by local voters in 2010 and regulates development in the city’s coastal commercial zones. If approved by voters the initiative would reduce Measure G’s 400,000-square-foot cumulative development cap. Local grassroots organizations also filed appeals with the California Coastal Commission to challenge City Hall’s boat launch ramp decision and the redevelopment project as a whole. Both appeals are expected to be heard together at a Coastal Commission meeting in late winter or early spring.